I saw AfricanExport's vid giving a review on this book and knew I had to do a post about it. I knew nothing about it till I saw her vid. I looked it up on Amazon just now and it's fairly new; was just released back in April. How cool is this, a textbook dedicated to our hair. I'm excited already. 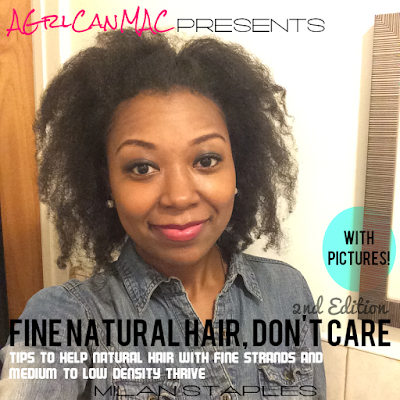 Based on AE's review, it seems like it could be a very informative read and something worth adding to your natural hair care library. I plan to add it to mine. Can I be frank with you? I don't take hair advice from very many people. I really have to trust the person I'm taking advice from and the person really has to know what they are talking about. One of the people that I trust implicitly when it comes to high texture hair know-how is Audrey Davis-Sivasothy. I have learned so much from her articles, so I was so excited to get her new book entitled The Science of Black Hair: A Comprehensive Guide to Textured Hair Care. Just browsing through and reading some of the chapters, I can already tell you that this is a must have reference book for women with high texture hair. In the book, Audrey actually lists recommended products based on what they can do for your hair's protein/moisture balance. The book is very technical, but also insanely practical and straight-forward. If you want to know the science of how our hair thrives and flourishes, get this book. It literally is a text book for managing high texture hair. You'll read about the hair structure, scalp structure, porosity, building healthy hair regimens, product selection, coloring, transitioning, hair care for children and so much more. Good books are an investment and worth every penny you spend on them. When you splurge on a $25 hair product, you and I both know that sometimes it's a hit, but a lot of times... it's a miss. With books like this, you actually get the knowledge you need to make more informed decisions as a consumer and save yourself time and money on your hair. So, before you take another trip to Ricky's, Whole Foods, Sephora or Target to hoard hair products that may or may not work, I highly recommend that you invest in The Science of Black Hair: A Comprehensive Guide to Textured Hair Care. I certainly will be keeping my copy of the book bedside while on my journey to waist length. Have any of you read or purchased the book? What were your thoughts? What's Heat Training Your Hair Mean?